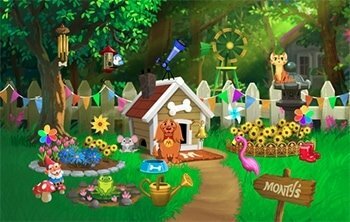 Monty’s Backyard Adventure App features seven games that flow seamlessly into one immersive and educational experience. The app is designed to be fun, easy to use, and provide the ideal learning tool for children ages 2-6. Activities include giving Monty a bath, playing fetch, and helping him explore objects and animals in his very own backyard. No in app purchases and no advertising! Hands-on activities help children develop fine motor skills and recall information in a fun and unique way. By playing and engaging in everyday adventures, children will practice the fundamentals of numbers. Children will care for and relate to Monty as they would their very own pat. They’ll also discover a world of animal knowledge from Monty’s. By playing fetch with Monty’s shape toys and color matching with Monty’s friends, children will master the basics of shapes and colors.